Alleged militant spokesman Mohammad Hanif after he was arrested near the border with Pakistan, eastern province of Afghanistan. A Surge in Afghanistan Too? Afghan officials have long accused Pakistan of harboring leading elements of the Taliban. And, they say, the confession of a leading Taliban spokesman arrested in Afghanistan on Monday further bolsters their claim. Abdul Haq, better known as Dr. Hanif, was caught just hours after crossing the border from Pakistan into Afghanistan in Nangahar province. 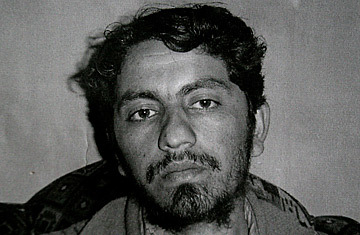 His capture, after he was followed from the border on a tip, was a success for the beleaguered National Defense Services (NDS), Afghanistan's intelligence branch, which has long been unable to prevent suspected Taliban militants from treating the poorly guarded border as a revolving door, entering at will to assist with attacks on Afghan and Coalition forces, then melting back into the sanctuary of Pakistan's ungoverned frontier zone. Afghan investigators say that under questioning, Dr. Hanif, who had been working with the Taliban for the past 14 months, told them that the organization would never have been able to challenge Afghan military and NATO forces without the direct assistance of Pakistan's Inter-Services Intelligence agency. "This means that according to his confession, the ISI of Pakistan is directly involved in funding, arming and supporting the Taliban and other opposition groups against the government of Afghanistan," says NDS spokesman Sayed Ansari. Although the ISI is believed to have played a major role in nurturing the Taliban and bringing it to power in the mid-1990s, Pakistan has routinely denied the accusation that it continues to provide support or a permissive environment for the organization. Just last week, outgoing U.S. National Intelligence Director John Negroponte warned that while Pakistan is "a frontline partner in the war on terror," it is also the country "where the Taliban and al-Qaeda maintain critical sanctuaries." Al-Qaeda, he said, is "cultivating stronger operational connections and relationships that radiate outward from their leaders' secure hideout in Pakistan to affiliates throughout the Middle East, North Africa and Europe." And on a visit to Afghanistan Tuesday, Defense Secretary Robert Gates reiterated the point, saying, "There are more attacks coming across the border; there are al-Qaeda networks operating on the Pakistani side of the border. And these are issues that we clearly will have to pursue with the Pakistani government." U.S. officials are skeptical about a recent agreement between Pakistan's government and local tribes in North Waziristan, under which Pakistani troops withdrew from the area on the understanding that the tribes would police all cross-border incursions into Afghanistan. The number of cross-border attacks from the area since the agreement is double the figure for the same period a year ago, according to U.S. military spokesman Colonel Tom Collins, addressing reporters traveling with Gates. "We are seeing evidence that the enemy is taking advantage of that agreement to launch attacks into Afghanistan." Dr. Hanif's confession is likely to turn up the heat on Islamabad. He is said to have told his interrogators that the recent surge of suicide attacks in Afghanistan were carried out by men trained at a fundamentalist madrassah in Pakistan's Bajur agency, not far from the Afghan border in Waziristan. And also that Mullah Omar, the one-eyed leader of the Taliban, was being sheltered by the ISI in the Pakistani city of Quetta. Dr. Hanif was instrumental in arranging a written interview with a Pakistani newspaper on Jan. 4 in which the reclusive leader warned, "Foreign troops should at once leave Afghanistan and then the institutions they created should be dismantled. Unless this happens, war will heat up further. It will not recede." The past year has been the bloodiest in Afghanistan since the fall of the Taliban regime in late 2001. Bomb attacks more than doubled, and suicide attacks increased fivefold. And far from skulking in the shadows, the organization was working to build its media profile. Dr. Hanif gave his mobile phone number to journalists, and could always be reached for a comment on the latest fighting. "NATO says 50 dead Taliban?" he would splutter indignantly. "Not one dead, and we killed 50 soldiers." And even if his count rarely matched reality, the chubby-faced 26-year-old knew how to spin a chilling quote, telling TIME last summer, after one particularly brutal suicide bombing in Kandahar had killed eight Afghan laborers working at a nearby military base: "These men were American servants, and they were punished." Dr. Hanif's capture comes as no surprise to the journalists covering the war, because his swaggering confidence kept him moving perpetually closer to discovery  in recent months, he had begun calling up journalists himself, to correct what he termed "misreporting" in their stories. He even berated one journalist last summer for referring to Dr. Hanif as a "man who claims to be a Taliban spokesman." Hanif's confession to the NDS appears to reflect a bitterness against Pakistan and the ISI, even a feeling that he was betrayed by them. But it may be just as likely that he simply got too cocky, making one call too many on the mobile phone that had made him a media celebrity. Coalition forces in Afghanistan are bracing for a major Taliban offensive in the spring. But with Dr. Hanif in custody, that offensive may lack the accompanying media barrage  at least until the "Doctor" is replaced.